Russia annexed the Black Sea peninsula from Ukraine in 2014. In May this year, Putin inaugurated a $7.5bn bridge to link the Crimean city of Kerch with the Russian mainland. of Sevastopol, and Olga Golodets, a former deputy prime minister of Russia who is overseeing the project. Delays to previous infrastructure projects have hampered the development of tourism in Crimea, on which the Russian government has been banking—it has been encouraging civil servants to take holidays there. During this year’s visit to Crimea, Putin focused on Tauric Chersonese, a Greek colony founded more than 2,500 years ago and now a Unesco World Heritage site. Both Russia and Ukraine regard the archaeological site in Sevastopol as the birthplace of their statehood. It is believed to be where Prince Vladimir of Kiev was baptised, introducing Christianity to the region. Putin has described Tauric Chersonese as “Russia’s Mecca”, and the site has also been called Russia’s Troy and Ukraine’s Pompeii. 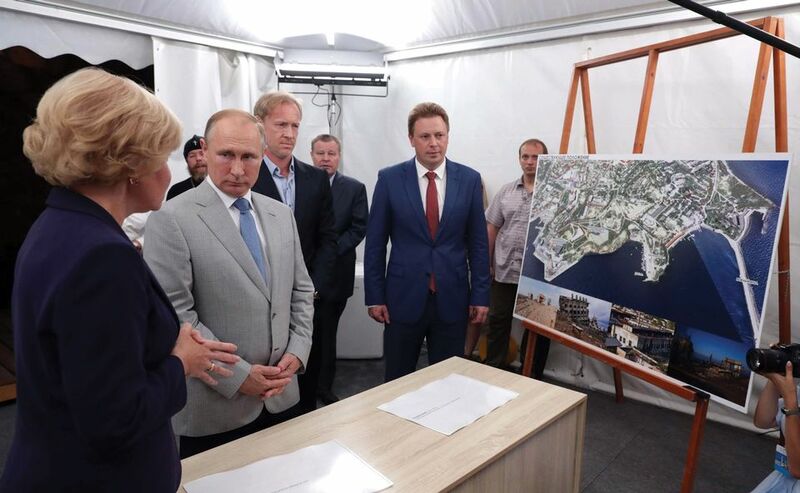 In the August meeting in Crimea, during which Putin, Golodets and Ovsyannikov studied aerial images of the proposed seaside site for the cultural hub, Crimea’s historic role as a centre for culture was emphasised. Golodets says that Crimea and Sevastopol “are totally unique for Russia and for Russian culture” because of the number of leading Russian writers and artists “who lived and created here”. The list includes the author Leo Tolstoy and the realist painter Ilya Repin. It is necessary, Golodets says, to bring back the “‘metropolitan nature of the cultural landscape of Crimea and Sevastopol at a completely new level”. Putin announced in his state-of-the-nation address on 1 March that the Russian government would build cultural centres in key regions, with Vladivostok, on Russia’s Pacific coast, first on the list. The programme, he said, would address the problem of the vast number of items in Russia’s major museum repositories that rarely or never go on show. In the Crimea meeting, Putin told Golodets that “the museum complex must, of course, by all means be worked out with and advised by both [Hermitage director Mikhail] Piotrovsky and [Russian Museum director Vladimir] Gusev”, as well as the Tretyakov. Golodets said that all were “involved in defining the concept”. The imposition of international sanctions on Crimea has made the role of Russia’s major museums in the peninsula a controversial one. Piotrovsky is an outspoken advocate of the return to Crimean museums of Scythian gold treasures that were lent to the Allard Pierson archaeological museum in Amsterdam just before the annexation. The objects, which both Ukraine and Russia claim, have been stuck in legal limbo ever since. The Hermitage has run archaeological digs in Crimea for decades. On 14 August, its press service announced that its team in Chersonese had uncovered a seal from the fourth/third-century BC, which had belonged to a bureaucrat named Heracles and was used to stamp government documents. In 2016, Ukraine accused the Tretyakov of breaking international law by showing paintings by Ivan Aivazovsky that came from the Aivazovsky National Art Gallery in Feodosia, his Crimean hometown. The 19th-century artist was known for his moody seascapes. Ukraine’s culture ministry says that the paintings were “unlawfully taken” from occupied territory and has called on foreign states to “halt co-operation with Russian institutions”. Specialists from the Tretyakov were sent to Feodosia in 2017 to work out a concept for redeveloping the museum. It is in the mansion where Aivazovsky lived and opened an exhibition hall in 1880.